Alex and Ani is now available at Sweet Paper, just in time for the holidays (the charm bangles are the perfect gift!). When Julie and I learned about Alex and Ani on a recent trip to the East Coast, we knew we had to bring the eco-friendly and positive energy jewelry line to La Jolla. Founded in 2004, Carolyn Rafaelian named her lifestyle company after her first two daughters. With the desire to spread positive energy across the globe, her values and charitable focus are expressed through her eco-friendly products, which are all Made in America. 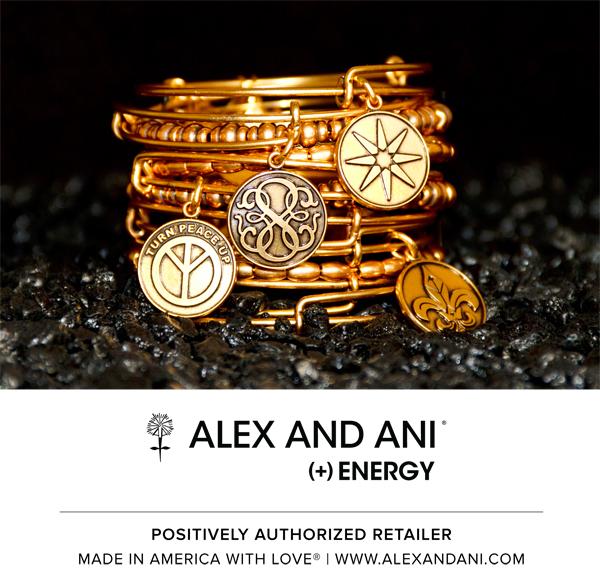 Alex and Ani’s signature Expandable Wire Charm Bangles have meaningful, spiritual and universal charms, which represent what is unique and authentic about the wearer. Knowing the powerful symbolism behind each bangle, its hard to choose just one, so I’ve narrowed down a few of my favorites to share with you. Stop by the shop to see all the amazing designs in store. Om Wrap – Om is an intonation, a sound resonating throughout the body into the soul. It signifies God, higher power, and the oneness of all beings in life’s cycle. The past, the present and the future are all represented in this one sound. Adorn yourself with the Om to connect with your inner spirit, accept serenity, and embrace your faith. Endless Knot Wrap – Representing the interweaving and ever-changing spiritual path, the Endless Knot expresses boundless wisdom and compassion. It illustrates an eternal pattern in its design, connecting one’s destiny bound by time and change. Wear the Endless Knot to remind you of life’s journey and the entanglements of faith. Mermaid Charm Bangle – The mermaid is a combination of elemental and angelic energies. She is also known as a mistress of enchantment. Seductive and charming, all those in contact with the mermaid are subject to her persuasion. Wear the mermaid as you learn to unleash your own unique charm. Sea Shell Charm Bangle – Sea shells connect us to the ocean and to the water’s energy. They enable us to gain clarity so that we make better decisions and life choices. They support, guide, and nudge us along our path to happiness and fulfillment. They bring about positive energy and promise fortunate outcomes in all areas of life. Seahorse Charm Bangle – In the belief that seahorses were a type of sea dragon, some Chinese cultures have revered them as a symbol of power and good luck. Their body structures only allow them to move in a very slow motion which has not evolved over time. They come to teach us patience and to accept ourselves as we are. Shark Finn Charm Bangle – The shark fearlessly navigates through all situations and confidently moves forward in life. With a distinctive fin located on its back for stability, a shark retains its balance and is equipped to handle any sudden twists and turns. Allow the energy of the Shark Finn Charm to guide you through life’s ever changing waters and to keep you stable in challenging times. 20% of all sales go directly to Finnz Fundz, an organization that seeks to provide direct assistance to children and families coping with long-term hospitalization in the fight against Cystic Fibrosis. Living Water Charm Bangle – Everything begins with water. It is the most precious resource that supports life in all of its forms. Water is the nourishment that mends us – body and soul. A purifying symbol, the Living Water Charm was created for daily reflection – leading us to the type of compassion and healing that quenches the thirst of the world. 20% of all sales go directly to Living Water International to support their work of demonstrating divine love by helping communities acquire desperately needed clean water.